We see it all the time. A customer needs to replace their worn out V-belts but after a few years of running, all the numbers on it are worn off. Or even worse, it’s been run to the point of looking like nothing but a loop of string with a little bit of rubber stuck on it. So how the heck do you figure out what belt to replace it with? Here’s how. To get the length, mark a starting point on the outside or topside of the belt. Using a flexible english measuring tape, measure all the way around the outside back to the starting point and take note of that measurement. 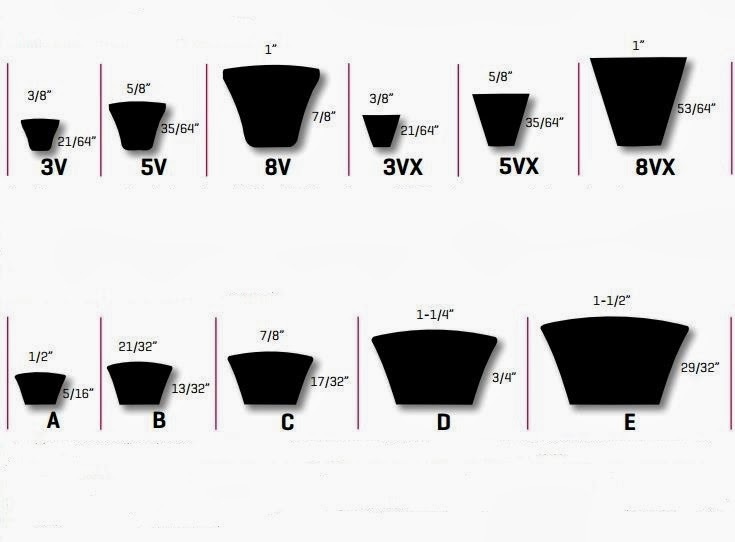 If you have determined that you have a 3V, 5V, or 8V simply take the length you measured, add the cross section in front if the length and add a 0 to the end. For example: 5V cross section + 65″ outside length + 0 = 5V650. Now you’ve got a good v-belt part number! A,B,C, D, and E belts are slightly more complicated. Their part numbers actually signify the inside diameter and not the outside diameter. The inside diameter is easily obtained, however, by simply subtracting a pre-determined factor for each cross section. Note the list below. So for a B section belt + 65″ outside – 3″ = B62. If the belt has cogs or teeth cut or molded into the inside of the belt, add an X after the cross section designation. Examples: BX62 or 5VX650. If you have multiple belts that have been banded or sometimes called ganged into one belt, put the number of belts followed by a “/” in the front of the number. A 3 band belt might look something like 3/B62 or 3/5VX650. *Note, v-belts are flexible rubber. Because of this it can be easy to make a mistake while measuring so always double check. In addition, belts can wear and stretch in a number of different ways depending on how they have been used. If you are unsure of your measurements, call, e-mail, or come into our service counter.